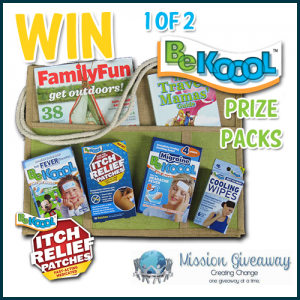 Grand Prize: A BeKoool Prize Pack for you and one to give to a friend! The Travel Mamas’ Guide is THE book on how to travel with babies and children…and stay sane! FamilyFun gives parents the ideas and inspiration they need to create unforgettable family moments. The magazine’s staff is made up of trusted experts on family vacations, cooking, celebrations, play, creative projects and learning—the full spectrum of fun that enriches the precious time families share. BeKOOOL’s Itch Relief Patches provide fast-acting, targeted, medicated relief from itching due to insect bites, poison ivy, minor skin irritations, cuts and scrapes. BeKOOOL is a complete family of products designed to add comfort and relief for the entire family. Kobayashi Healthcare, LLC manufactures and distributes BeKOOOL products, along with several other brands including ClearWipe® pre-moistened microfiber lens wipes, and Cura-Heat® therapeutic heat patches for minor muscles aches and pains. BeKOOOL’s new Itch Relief Patch is the first product of its kind in the anti-itch sections of leading retailers, and became available in March 2013.